Definitely, the last thing you want to do is talk about it! We’re scared! We’re all scared! And stressed! Why would we want to talk about that?! It’s best just to pretend it’s not happening. They don’t even need to know why you’re packing up the house. No, no, no. That’s backwards! It’s happening, you can’t change it. Acknowledge the emotions that go along with the transition and give your children the freedom to share their feelings with you or someone else. Think about your own emotions. Even as adults we sometimes have difficulty processing our own feelings, how much more for a child or teenager? Giving a voice to negative and positive emotions allows the brain AND heart to process what’s happening. For sure. Wherever your passport country is you definitely want your kids to understand all the bad things they will be encountering while living there. Actually, the more you complain the more they will be prepared to face their new world, right? Um, no. This side of heaven there is no such thing as a perfect country or place to live. Moving is hard on everyone. There are things we will miss, things to look forward to, positives and negatives about any location we find ourselves in. This is a good time to work on balancing joy and grief. Joy at the memories that will last a lifetime, joy from old and new relationships, grief from saying “bye” and losing special relationships, grief from what we will miss. I mean, you’re going to be leaving again in just a few months. Obviously it’s best to make sure they don’t build meaningful relationships in your passport country so you can avoid them getting hurt later, right? Wow, definitely don’t listen to me! That’s horrible advice. Of course you want your kids to have meaningful relationships in your home country! It contributes to a sense of belonging, connectedness, and creates positive memories for them. You can’t exactly predict which country your children will choose to live in as adults. Give them a leg up by making sure they have the opportunity to feel connected in both countries (or more if that’s your situation). They are MK’s/TCK’s after all, they need to be adaptable! You should actually consider travelling for the entire time to ensure they’ll not have any type of schedule to get used to. Incidentally, this will also take care of #3 as they may avoid seeing the same people twice and getting too attached. Again, terrible advice. Children and adults need consistency and structure of some kind. Some more than others, sure, but we need it nonetheless. Whether your children are homeschooled or attend a brick and mortar school they still need and thrive on structure. Daily routine and structure contributes to overall physical and emotional health in both children and adults. You know it’s true! So, do talk about the transition. Learn to enjoy and see the good in every location you find yourself while balancing frustrations. To the best of your ability work to provide opportunities for your kids to build meaningful relationships and celebrate those memories. Make your best effort at creating structure and consistency that works for your family. What are YOUR tips or tricks for ways to improve your “home” assignments? Certainly no one can guarantee a pain free experience, in fact you can guarantee there WILL be pain, but generally speaking I’ve observed these things to be true in my own life and in others. **As a little addition to this post I thought I’d share something from my own childhood. My Mom, who keeps all things potentially sentimental, gave me my old 4th grade journal last year. My teacher had us write in it regularly. 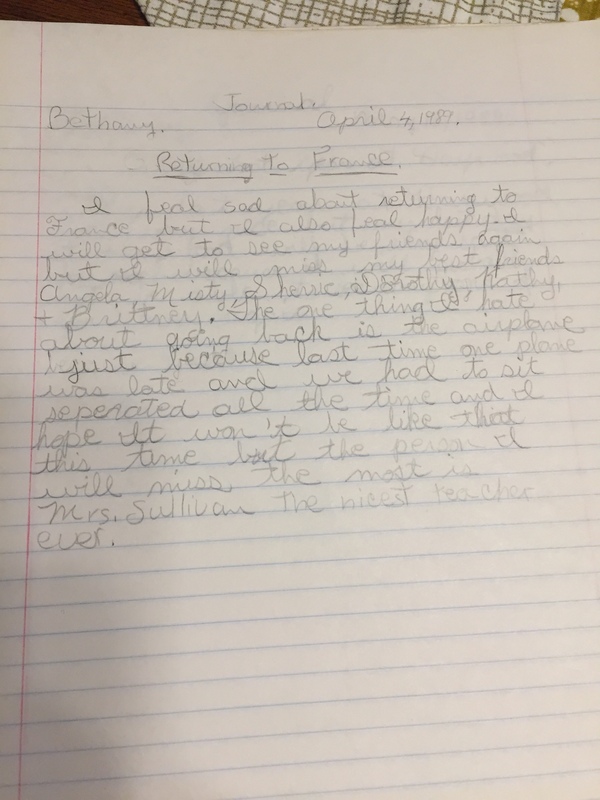 I was amazed when just a few days ago I ran across this journal entry…(I did not edit it). “I feel sad about returning to France but I also feel happy. I will get to see my friends again but I will miss my best friends Angela, Misty, Sherrie, Dorothy, Kathy, and Brittney. The one thing I hate about going back is the airplane just because last time one plane was late and we had to sit seperated all the time and I hope it won’t be like that this time but the person I will miss the most is Mrs Sullivan the nicest teacher ever”. – I have no idea who those people are other than they were classmates. – I DO remember Mrs. Sullivan. She was great. – I DO remember sitting separately on the airplane and we still talk about that sometimes. – I felt both SAD and HAPPY at the same time, isn’t so much of life that way? Ahem. Don’t you know that the person you were going to miss most was ME??? I, for one, am glad your parents allowed you to make connections!! Hahaha! I know! I was so shocked your name wasn’t there! Thanks so much for wise words. One thing we discovered during our most recent Stateside assignment is that our teens stayed connected with friends in Spain through social media while in the States. Since being back they stay in touch with friends in the US more than they ever had before. It is an interesting phenomenon because, while helpful in some ways, it can also be distracting. Hi Lea! I love how your kids have found a way to stay connected. The pros and cons of social media are tough to navigate sometimes, for sure. Well said Bethany. Your suggestions are on target. When I did some research on the attitudes of MK concerning how they relate to their host and passport cultures they identified highly with both. Keep writing. I agree with Neil. Keep it up!